1. Consider the tone of the text. As we develop sensitivity to the text and the setting of the text, we should be increasingly effective at grasping the tone of the author. We need to go for a humble confidence rather than a brash confidence in this. We are looking at lots of factors and weighing them up. 2. Consider the listeners to the message. Who are you preaching to, and what is the occasion of the sermon? Sometimes the occasion will influence the tone significantly (i.e. a funeral), sometimes it will be less significant. It is not enough, though, to figure out the tone of the text and replicate that. That text needs to be preached with sensitivity to these listeners. 3. Consider yourself as a preacher. What is your natural or default tone? Do you have a theological bias? For instance, do you see everything as duty and expectation? Do you see everything as gentle and joyful? Do you turn any passage into a guilt trip? The better you know yourself, the better you will be at selecting tone on purpose rather than defaulting into a tone that is less than helpful. When you have evaluated all these factors, then there is still a bit more to consider. 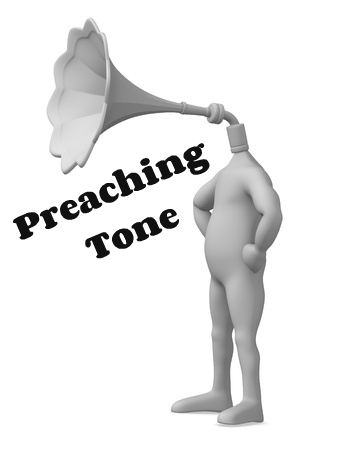 Next time I’ll blog about the dangers and the needs as we think about preaching tone.